So you may be a street racer but with a large exposable income what would you take to the streets to compete in a knock-down drag race? 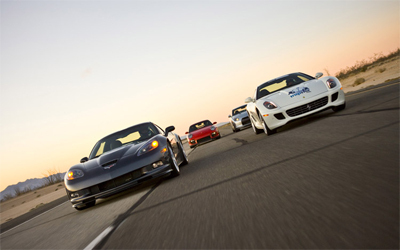 Would you choose the new Corvette ZR1, Ferrari 599 GTB, Porsche 911 GT2 or the Nissan GT-R? Which one would win in street drag race? You may be surprised. Motor Trend has put together a nice little video of all 4 of these supercars in a dirty street drag race. Who will win? I will give you a hint: This is one race that the GT-R haters may actually like. Enjoy the Video (after the jump)!